Growing up, I thought it was so weird, well – if I am honest, embarrassing, that Grandma Florene and Grandpa Willard took my sister and I with them to shop at the “dented-can” stores and day-old bread stores. I also thought it was weird that in the spare bedroom, of their little 2 bedroom house, was a shelf full of canned goods and non-perishables. On my high school graduation day, Grandpa Willard handed me an envelope with a $100.00 bill in it. I knew where that money came from. 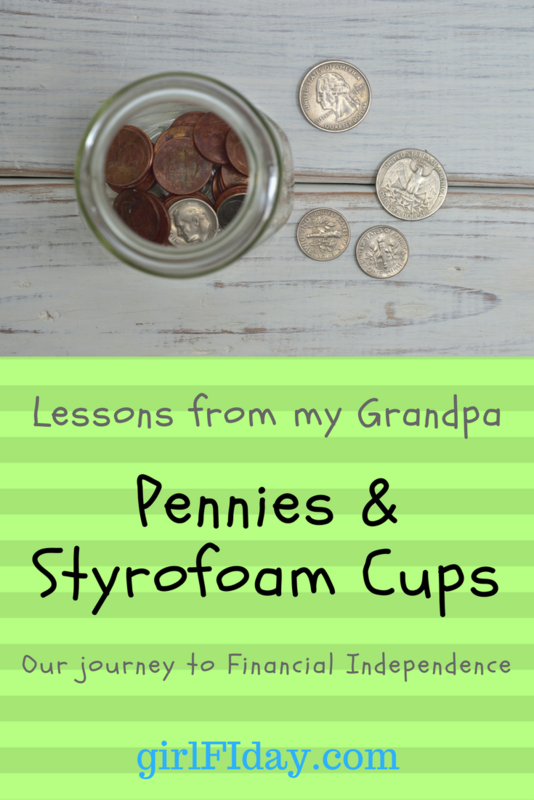 For years, I saw stacks of KFC Styrofoam containers with a slit cut into their lids filled up with pennies. There were towers of them on a shelf by the side door. I did not know what he was saving up for then, but when I received that $100.00, I knew and I knew how long he had been saving to give me this gift. What I wouldn’t give now to sit down with my grandma and talk to her about their frugality. Or my grandpa. But he was a man of few words. I don’t know if I can recall a sentence with him that had more than five words. That didn’t matter – he loved us. Man, how he loved us. He never had to say it – the look in his eyes was enough. And this gesture, pennies saved for years, every penny purposefully set aside for me and my sister – we always knew. I know now, their frugality was born out of extreme hardships encountered during the wars before we were born. Need we haven’t really experienced as a nation since then. We have faced recessions, extreme unemployment, the bursting of bubbles and the “great recession” but even so, the marker of our recovery was a pole vault back into the same consumerism all over again. Frugality didn’t sick – it hasn’t “stuck” for the vast majority of Americans since then. When times are hard, we can’t wait to be able to freely spend again. Which is never really free, it comes at an expense. Interest, debt, payments over time. Curt and I have participated fully in all of it. And here we are. In a heap of debt. Drastically behind in our savings. But changing. Not slowly – it was like light switch. Once we saw what we could accomplish if we “exited” ourselves from the current consumerist undercurrent and into a simpler one, we find “opportunities” daily to spend less, save more and pay down debt. In less than six months, we have seen our savings rate jump from nothing (a big fat ZERO) to over 20%. We have paid off several credit cards, a car and other accounts. Our (negative) net worth is getting LESS negative every month. It’s like those pennies. One penny at a time. Every day. Turns into stack of pennies, that turns into something big. Without even thinking about it too much. I have a coin jar in my office. Every day one or more of us put coins in it. Left-over change we find, change from purchases, change I find in the laundry. I started the jar a few weeks ago and to date we have we have about $25.00 in it. Soon it will have $100.00. We intend to then deposit it to be invested into an index fund so those pennies can turn into even more pennies. Then we will start the process all over again. Some might think that’s a little weird. I don’t think my Grandma or Grandpa would think it weird at all.